Thursday, July 24 — Gulfstream Park will resume its Thursday-to-Sunday summer meet this afternoon with a nine-race card that has 91 entrants, including one Also Eligible. Gulfstream’s number of entrants per race also is just over ten for this Friday and Saturday. That sets it up for a continuation of the impressive handle it has generated this month, following the June 29 end of its head-to-head weekend racing with South Florida neighbor Calder Casino & Race Course. Our review of Equibase Co. charts shows that Gulfstream has averaged 9.3 starters per race with average daily all-sources handle of $3.9 million for its 12 racing days between July 1 and July 20. For the four days between July 17 and July 20, Gulfstream averaged 9.5 starters and $4.0 million in handle. Breakdowns between live and off-site handle were not available. Gulfstream’s fields are among the largest at the country’s leading Thoroughbred tracks, and last weekend its total handle virtually tied for third place with Monmouth Park. Only Saratoga and Del Mar are generating higher handle than Gulfstream. Gulfstream’s July numbers compare very favorably with last month, when its average daily handle was in the $3 million range and average starters were just over eight per race. Calder’s handle was in the $800,000 to $900,000 range during the second half of June, with averages of six or seven starters most days. Basically, the schedule change has left South Florida with one track racing four days a week rather than two tracks racing every Friday through Sunday–with Gulfstream’s higher and rising purse structure. Calder was averaging about $100,000 in purses per day for its eight-race cards. Gulfstream this month is averaging ten races a day. It had average purses of $220,000 for the four days between July 17 to July 20. Starting today, it is raising purses an average of 10 percent a day under an agreement with the Florida Horsemen’s Benevolent and Protective Association. 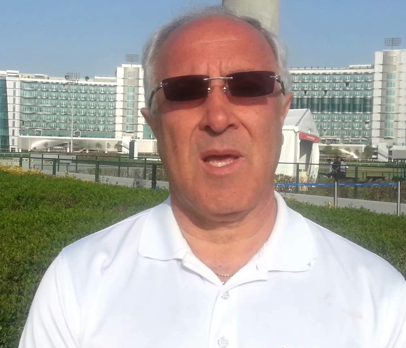 Trainer Carlo Vaccarezza is among South Florida horsemen who, along with Gulfstream management, expect that the track’s field sizes and handle numbers will grow during the next several weeks. Gulfstream has 1,250 horses in its stables and access to 450 more at Calder. Its affiliate Palm Meadows training center in Boynton Beach is closed for resurfacing and will re-open by September. From his own contacts and information from Gulfstream, Vaccarezza has heard that some trainers who do the Saratoga-Belmont-Gulfstream circuit will send some of their horses directly to Gulfstream after Saratoga ends its meet early in September. In addition, he expects that a continuation of strong Gulfstream numbers will result in some trainers soon sending down some horses from Arlington Park near Chicago and from Monmouth Park in Oceanport. N.J.
On Friday, Gulfstream will have ten races with 111 entrants. That includes three Also Eligibles and five Main Track Only runners. Saturday’s 11-race card has 117 entrants, including four Also Eligibles and two for the Main Track Only. Even with routine numbers of scratches, the average field size should be near or above ten each day. Gulfstream this afternoon will release its entries for Sunday. One point of reference for Gulfstream is that from last Friday through Sunday, it beat Monmouth Park in average handle per race–with about $430,000 per race compared with $390,000. Monmouth has a long-entrenched summer-fall meet that is popular with fans in its surrounding New Jersey shore communities and it has a nationwide simulcast and ADW fan base. 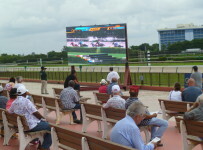 By keeping pace with Monmouth, Gulfstream is showing the popularity of its brand for fans watching on TV and computer screens–even though it is in just its second season of summer racing.